This super small mono amplifier is surprisingly powerful – able to deliver up to 2.5 Watts into 4-8 ohm impedance speakers. 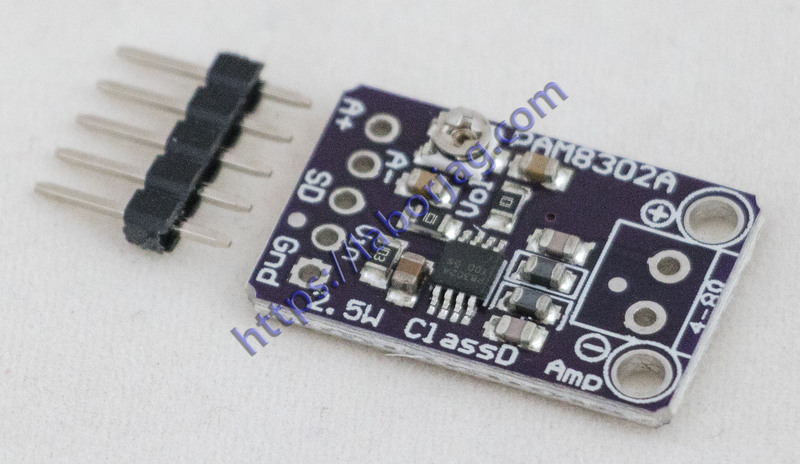 Inside the miniature chip is a class D controller, able to run from 2.0V-5.5VDC. Since the amp is a class D, its very efficient (over 90% efficient when driving an 8 speaker at over half a Watt) – making it perfect for portable and battery-powered projects. It has built in thermal and over-current but we could barely tell it got hot. There’s even a volume trim pot so you can adjust the volume on the board down from the default 24dB gain. This board is a welcome upgrade to basic “LM386” amps! The A+ and A- inputs of the amplifier go through 1.0uF capacitors, so they are fully ‘differential’ – if you don’t have differential outputs, simply tie the Audio- pin to ground. The output is “Bridge Tied” – that means the output pins connect directly to the speaker pins, no connection to ground. The output is a high frequency 250KHz square wave PWM that is then ‘averaged out’ by the speaker coil – the high frequencies are not heard. All the above means that you can’t connect the output into another amplifier, it should drive the speakers directly. Comes with a fully assembled and tested breakout board. We also include header to plug it into a breadboard and a 3.5mm screw-terminal blocks so you can easily attach/detach your speaker. You will be ready to rock in 15 minutes! Speaker is not included, use any 4 ohm or greater impedance speaker. Filterless design, with ferrite bead + capacitors on output. Fixed 24dB gain, onboard trim potentiometer for adjusting input volume.